This news story from CBN fits with Biblical prophecy. As many of you know, I believe the best fit from Scripture and from what we see unfolding in history right now is for the coming Antichrist to be a Muslim leader, most likely the Mahdi, which the Muslim world believes; his appearance is imminent. For more information, check out Joel Richardson’s book The Mideast Beast – Scriptural Case for an Islamic Antichrist. Daniel 2 & 7 reveals Medo-Persia and Greek Empires would succeed Nebuchadnezzar but Daniel does not reveal the fourth Empire. However, the description given that the fourth Empire would completely crush the former territories of the previous three Empires, reveals the identity of the only Empire to accomplish this feat. It is an Islamic Caliphate – The Ottoman Empire. Because of circumstances at the time, the early church believed the Antichrist will be the leader of a revived Roman Empire, but in hindsight, we can see that a Roman Empire does not qualify. The Final Empire is a revived but divided fourth Empire – an Islamic Caliphate which the Antichrist will rule, partially overcoming the Sunni/Shia divide as both sects are expecting the Mahdi, who they believe will have all the miracle working power of the Biblical Antichrist. Considering the large numbers of Muslims in most European nations now, imagine their reaction to the Mahdi’s entrance on history’s stage. When the Ottoman Turks tried to invade Europe 500 years ago they were defeated at the Gates of Vienna. Today Turkey again has designs on Europe, but it’s using a different method. It’s being called Turkey’s fifth column in Europe, a vast network of radical Islamist’s, working inside Turkish mosques and under the control of Turkey’s ambitious president, Recep Tayyip Erdogan. The Austrian government shut down seven mosques and expelled 60 Imams recently because they were being funded illegally by the Turkish government, and because photos from inside the mosques surfaced on the internet showing Turkish children being trained to be martyrs. Austria’s move against the mosques infuriated Turkey’s government, and President Erdogan warned of a “coming war between the cross and the crescent.” The leading expert on Erdogan’s network of mosques, Turkish journalist Abdullah Bozkurt of the Stockholm Centre for Freedom, calls them Erdogan’s fifth column. He spoke to CBN News from Stockholm, Sweden. “What we have been seeing in the last couple of years, an increase of activity on the part of the Turkish government to turn the mosques that were financed by the Turkish community and by the Turkish government, or imams that were deployed directly from Turkey, as sort of political operatives,” he said. 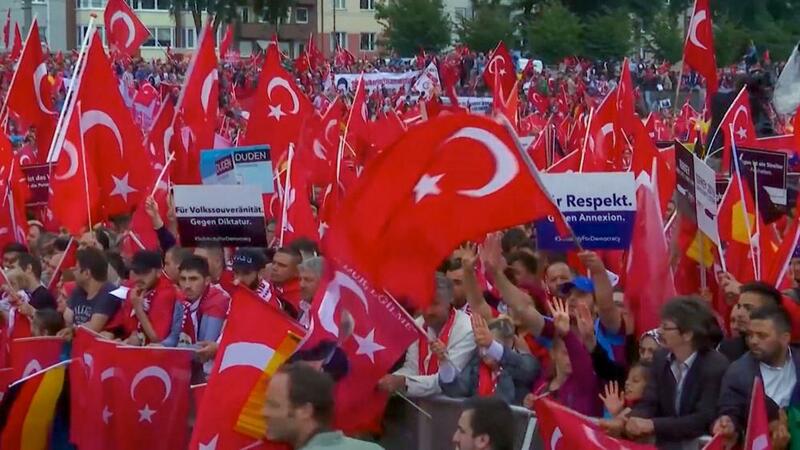 There are an estimated five million Turks in Germany and millions more across Europe. Bozkurt says several Islamic and charitable organisations run by the Turkish government are fronts for political activity. Shocking images show Erdogan supporters and Kurd’s fighting on the streets in Belgium. Bozkurt says Erdogan’s network is a proxy force that can cause social unrest on the streets of Europe and keep Muslims there in line. “This is first and foremost a threat to the Muslims actually living in Europe and other countries because anybody who is not subscribing to this ideology of their own government is deemed a threat, traitors, or even infidels,” he told CBN.